With alternate captain Steve Sullivan at his side, Kimmo Timonen speaks to the media Tuesday about his new role as the Predators' next team captain. Nashville Predators Head Coach Barry Trotz announced Tuesday that defenseman Kimmo Timonen has been named the third captain in franchise history while forwards Paul Kariya and Steve Sullivan will serve as his assistants for the 2006-07 National Hockey League season. "Each of these players has the qualities we are looking for in our team leadership," said Trotz. "They are all consummate professionals and top players that play with passion and integrity every night. They have the respect of their teammates, coaches, management and fans." Timonen, 31 (3/18/75), has appeared in the second-most games (493) in franchise history and enters the 2006-07 season one point shy (66g-180a-246pts) of tying Scott Walker as the Predators' all-time leading scorer. The Kuopio, Finland native was acquired from Los Angeles on June 26, 1998, he joined the Predators midway through the club's inaugural season (1998-99) and has since become Nashville's all-time leading defenseman in games played, goals, assists and points. He has worn the "A" for Nashville since 2001-02, led the team in average ice time in four of the past five seasons and has been named to two NHL All-Star Games. "Kimmo is a top player on this team and a top player in the National Hockey League," said Trotz. "He is an original Predator, has been a big part of the growth of this franchise and has been a strong leader for us for a long time." 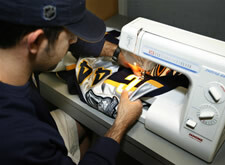 Assistant equipment manager Jeff Camelio sews the "C" onto Kimmo Timonen's jersey Tuesday morning. Kariya, 31 (10/16/74), and Sullivan, 32 (7/6/74), each wore the "A" for Nashville at times in 2005-06. Kariya, a three-time NHL First Team All-Star and a former captain of the Anaheim Ducks, led Nashville in scoring last season with a franchise-record 85 points (31g-54a-85pts). Sullivan, acquired from Chicago in a trade on February 16, 2004, has averaged over a point per game (40g-57a-97pts in 93 games) as a Nashville Predator. Tom Fitzgerald, who will drop the ceremonial puck before the Predators' opener on Thursday night, was the first captain in Nashville Predators history, wearing the "C" from July 6, 1998-March 13, 2002. Greg Johnson took over as the team's captain prior to the 2002-03 season and held the role through the end of last season. The Predators open up the 2006-07 National Hockey League season on Thursday night at 7:00 p.m. against the Chicago Blackhawks at the Gaylord Entertainment Center. Individual tickets for Thursday night's game are still available. (Order now.) Tickets for the entire Predators' 2006-07 regular-season home schedule may be purchased online. Tickets may also be purchased at the GEC box office, at all Ticketmaster outlets or by calling (615) 770-PUCK. Predators season-ticket packages are still available for as low as $156; call (615) 770-PUCK for more details.